Stuttgart's urban area is 20,731 hectares in size, of which about 28 % is built up. About 50 % is used for forestry or agricultural purposes. The map provides an overview of the small-scale partition of Stuttgart. The area is divided into 152 districts. The local energy company provides about 161,000 customers in about 52,000 buildings in Stuttgart with natural gas. About 3,900 GWh of natural gas (adjusted for degree-day figures) were procured in 1995. Beyond that, about 920 GWh of natural gas are procured to power stations for the generation of district heat and power (Gaisburg, Münster, University). The map gives the distribution of the gas supply to customers in Stuttgart in relation to the city blocks within the urban area. The local energy supply company provided Stuttgart with about 3,720 GWh of electricity in 1995. This amount has remained almost constant since the beginning of the 1990s. The map gives the local distribution of the power consumption in Stuttgart. Areas with a particularly high power consumption are the city centre, vast adjacent commercial areas as well as several bigger individual complexes. The local energy supplier provides about 7,800 customers in about 3,400 buildings in Stuttgart's city centre and the districts adjacent to the Northeast with 1,400 GWh/a of district heating in the form of heating water and vapour via a distribution network of about 225 km. Beyond that, the University of Stuttgart runs its own combined heat and power station in Pfaffenwald and generates district heating with an output of about 100 GWh/a for a distribution network of about 13 km. 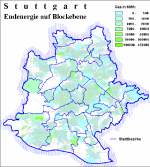 The map shows the distribution of the district heating supply within Stuttgart's urban area according to city blocks. The amount of energy used for room heat plays an important role, beneath traffic, as for the energy requirements within the city area. About 7,700 GWh of heating energy are used in Stuttgart to cover the requirements for room and water heating. 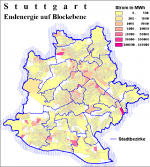 The map gives a detailed picture of the use of heating energy in Stuttgart according to city districts. District heating is predominant in the city centre. In districts where district heating is not available, natural gas often has a market share of more than 50 %. Fuel oil only has noticeable market shares in the outskirts. 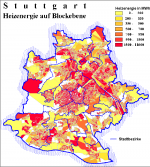 A detailed examination of Stuttgart's use of heating energy according to city blocks shows that district heating is predominant in the city centre. In districts where district heating is not available, natural gas often has a market share of more than 50 %. Fuel oil only has noticeable market shares in the outskirts.